So unless you’re Ethiopian or Eritrean, many of you won’t be familiar with Meskel celebrations. Back home, celebrations take place in Meskel Square, Addis Ababa. Thousands of tourists, pilgrims, and people from diverse communities attend to witness such a colourful, spiritual event. 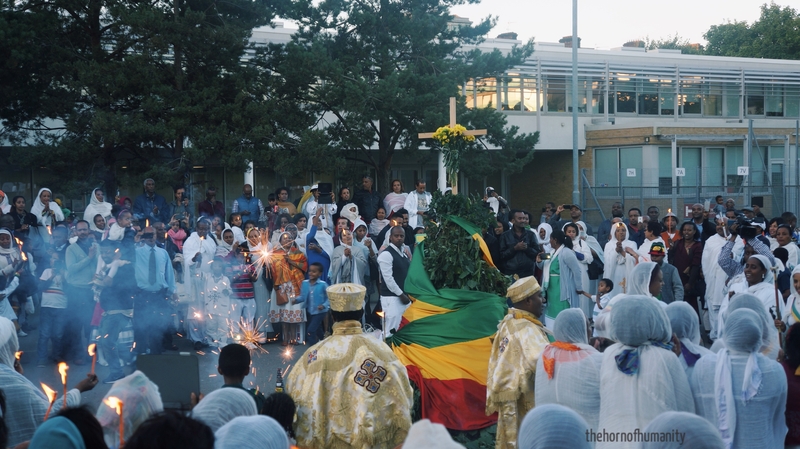 Being one of the most devout Orthodox communities in the world, Ethiopia is the only country that celebrates the finding of the cross on a national level. 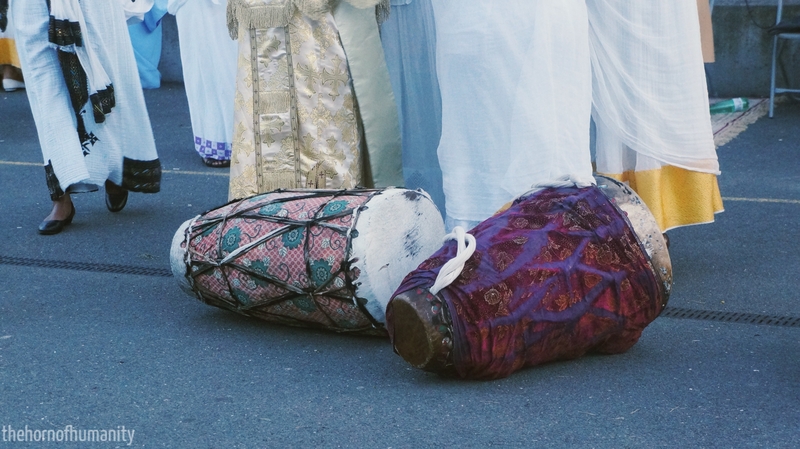 Thanks to the Ethiopian and Eritrean diaspora, such festivities now take place all over the world. 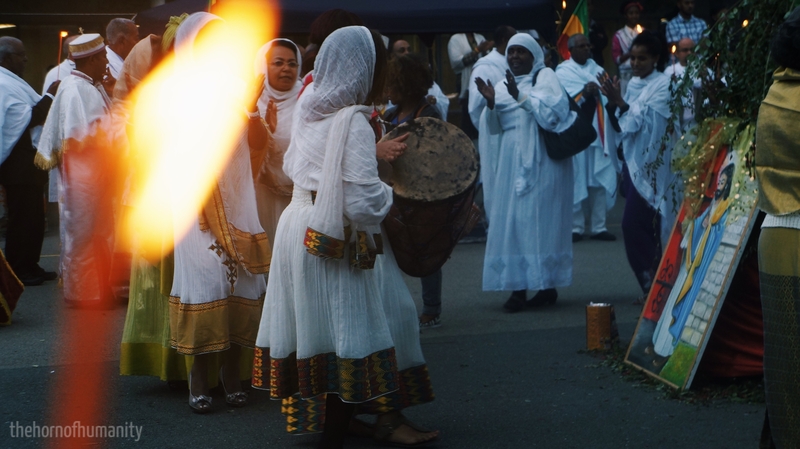 I myself spent my Sunday at a Meskel event in London, and thought it would be a perfect chance to take photos for my blog. Although it wasn’t the same as Meskel Square in Addis, it was a beautiful experience all the same! 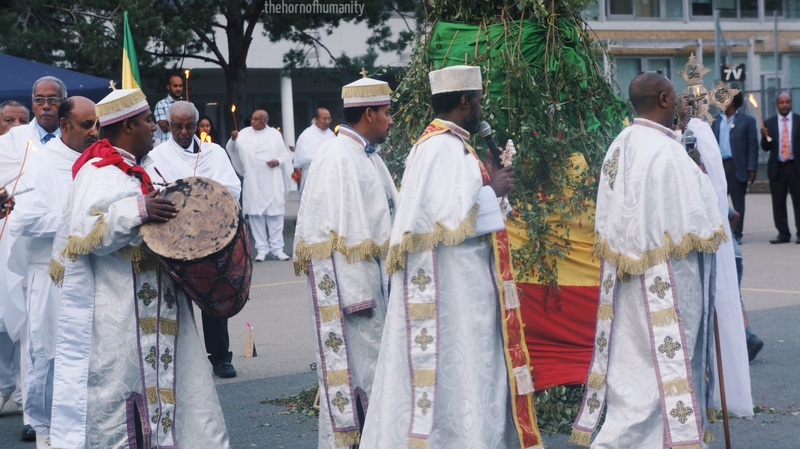 With a few hours to prepare, members of the Ethiopian Orthodox Church begin to decorate the bonfire. Meskel celebrates the finding of the True Cross during the 4th Century when Empress Helena, mother of Constantine the Great, discovered the True Cross on which Christ was crucified. Having found the Holy Cross, Queen Helena lit torches to declare her accomplishment. As the legend goes, Helena had a dream that the smoke from a bonfire would guide her to the burial of the True Cross. When she found it, Empress Helena is said to have given a piece of the Cross to all churches, including the Ethiopian Church. Parts of the True Cross are said to reside in the mountain of Gishen Mariam monastery, the north eastern Wollo region. Pieces of such a relic date back to 2,000 years ago, and is ranked among the world’s most acclaimed of scared objects. 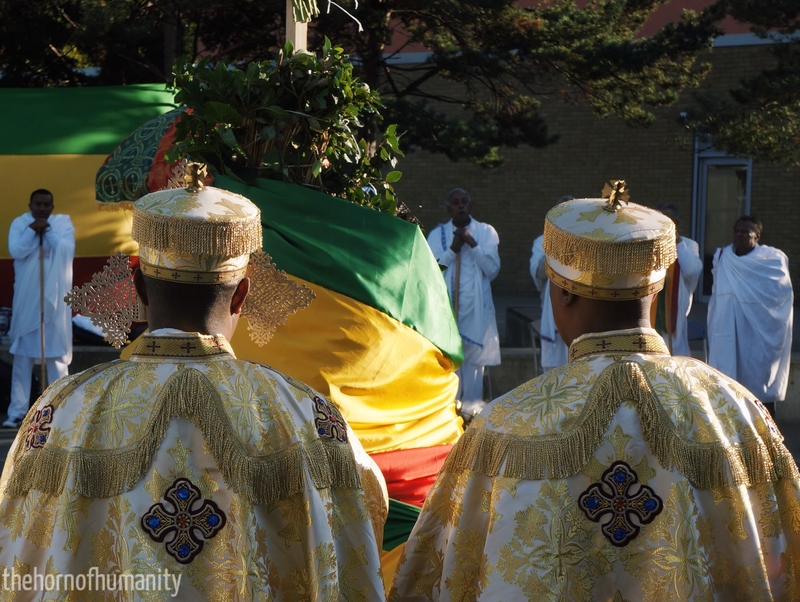 Meskel celebrations began with spiritual prayer and reflection. The religious festival itself is spread across the course of two days. On the 27th, is Demera, in which bonfires are built around a large Cross. However, this isn’t just any bonfire. This bonfire is decorated with colourful flags and vibrant flowers. The flowers, called Meskel daises, are bright yellow blossoms, particular to Ethiopia. Even non-Christian Ethiopians have reason to rejoice on Meskel as yellow flowers signify the end of the rainy season. As such, Meskel links in with the unique Ethiopian calendar, known to have “13 months of sunshine”. The Patriarch of the Ethiopian Orthodox Church then orchestrates the lighting of the bonfire. After the bonfires are sanctified they are lit, inviting songs of praise, and dances of happiness. On the 28th, people take time to enjoy good food and drink, accompanied by song and dance. Traditionally, people use ashes from the fire to mark their heads with the sign of the cross. What makes Meskel unique is that it manages to invite thousands of people from all social backgrounds, producing an essence of serenity without any concerns over security. Songs of praise fill the air as people rejoice. Its ability to promote such peaceful community cohesion contributed to UNESCO’s decision to add the festival of Meskel on the Representative List of the Intangible Cultural Heritage of Humanity. 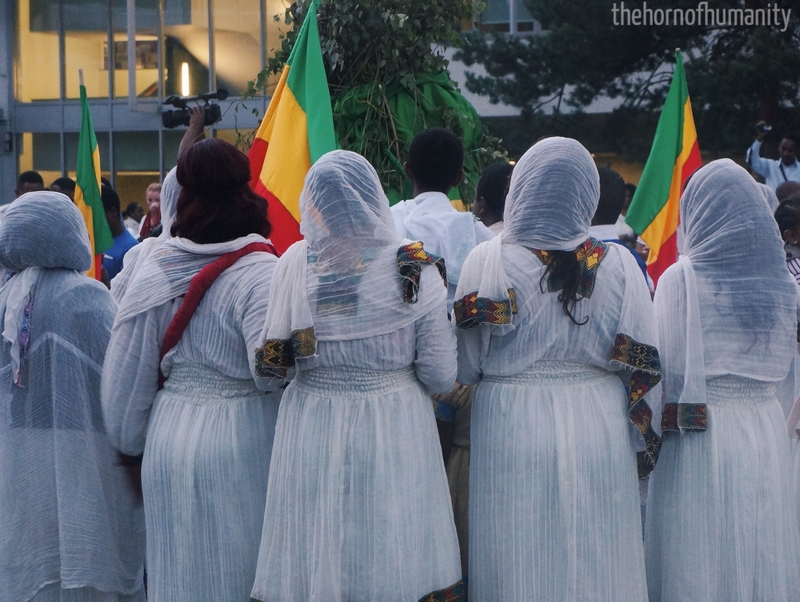 UNESCO proclaimed that “Rooted in the religious and cultural traditions of Ethiopia and passed on from generation to generation, the Meskel festival promotes social unity, integration and diversity across the nation”. I love reading and learning things about Ethiopia. It’s fascinating. Music was what got me interested in the culture. The heavy influence of Jah Rastafari in dub and reggae music was what made me want to learn more! Well written – keep it up!